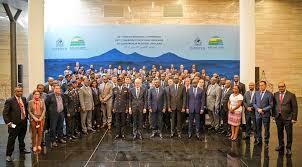 Terrorism and organized crime threats are the main issues being addressed at the 24th Interpol African regional conference, which opened Tuesday in Kigali (Rwanda) with the participation of high ranking police officials from several African countries, including Morocco. The North African Kingdom is represented in this Interpol regional gathering by Mohamed Dkhissi, Director of Judicial Police at the General Directorate of National Security (DGSN) and Chief of Interpol Bureau in Morocco. “All continents are facing growing threats of organized crime and terrorism”, said Rwandan Prime Minister Edouard Ngirente in his opening address. “These threats undermine the development of Africa but also constitute a violation of human rights. To stop and prevent these threats, there is an urgent need for strong cooperation. No single country can alone win this struggle. We need much stronger regional and international cooperation”, stressed the Prime minister. For his part, Interpol Secretary General Jürgen Stock underlined the conference’s role in strengthening regional and international police cooperation to serve better Africa’s security needs. “Africa, like every region in the world is facing complex terrorism and organized crime threats, so making sure that the police on the ground have access to data when and where they need it, is critical”, he said. “The momentum of terrorist-related data sharing across Africa via Interpol is unprecedented and we will continue to build on the successes of recent operations targeting human and drug trafficking,” added the Interpol Chief. The Kigali meeting comes just weeks after the terrorist attack in Nairobi, which claimed 21 lives, following which an Interpol Incident Response Team (IRT) was deployed to provide on-site support to Kenyan authorities. Criminal intelligence analysis, digital forensics, weapons and explosives experts within the IRT have provided assistance to Kenyan Police enabling them to exploit data and develop investigative leads. Some 158 Chiefs of Police and other senior law enforcement officials from 42 countries and seven regional and international organizations are attending the three-day (5 – 7 February) conference in Kigali hosted by the Rwanda National Police.